Manuka Health`s NZ Propolis BIO30 and MGO 400+ Manuka Toothpaste combines two natural active ingredients. New Zealand Propolis BIO30, for effective oral hygiene and the unique activity of MGO 400+ Manuka Honey, which assists in maintaining healthy teeth and gums. Essential oils and herbs have been added to provide great taste and leave teeth feeling fresh and clean. Calcium Carbonate, Aqua, Sorbitol, Glycerin, Leptospermum Scoparium Mel, Lauryl Glucososide, Silica, Cellulose Gum, Magnesium Aluminium Sillicate, Aroma, Titatium Dioxide, Propolis Extract, Menthol, Glycerrhiza Glabra, Leptospermum Scoparium Oil, Chlorophyll. For better results brush your teeth with Manuka Health BIO 30 NZ Propolis & MGO 400+ Manuka Toothpaste after every meal. Below are reviews of Propolis & MGO 400+ Toothpaste with Manuka Oil - 100g by bodykind customers. If you have tried this product we'd love to hear what you think so please leave a review. My favourite toothpaste ever! DELICIOUS! 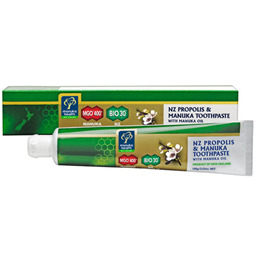 Manuka Health`s NZ Propolis and MGO 400+ Manuka Toothpaste combines two natural active ingredients. New Zealand Propolis, for effective oral hygiene and the unique activity of MGO 400+ Manuka Honey which assists in maintaining healthy teeth and gums.